Underneath its bass-dropping, high-fashion-flouting, sick-opening-credits-having exterior, David Adjmi’s “Marie Antoinette” is actually pretty old-fashioned. It might as well be an update of Shakespeare’s “Richard II.” It tracks the fall from grace of a ruling figure who, while they might have been a really terrible ruler, is nonetheless deserving of their due as a complex, often sympathetic, human. Substitute Shakespeare’s flowered verse for Adjmi’s Paris-Hilton-gone-clubbing inflections and the two are pretty identical. What’s fresh about Adjmi’s take on France’s most famously tragic (or is it tragically famous?) queen is that it is tailor-made for a modern understanding of celebrity. Adjmi’s Marie has been born into a life of riches and fame. She knows nothing else, and is as much a product of her environment as she is its progenitor. Under the gleefully propulsive direction of New York theater artist Robert O’Hara, Steppenwolf’s Marie Antoinette also has the benefit of being portrayed by the fiercely intelligent and elegantly crass Alana Arenas. Her performance alone makes Marie a woman worthy of our attention. Adjmi’s play tracks Marie from roughly the age of twenty-one, seven years into her marriage to Louis XVI (Tim Hopper), through the French Revolution and her death by guillotine at age thirty-seven. Short scenes trace Marie’s gradually growing awareness that not only is all not well in her marriage to the strange, recalcitrant Louis but that literally nothing is going well in her marriage to the French people. The first half, beginning with the Guy-Pearce-does-fashion-week opening credits by Jeff Sugg and pounding club soundtrack by Lindsay Jones, is an exercise in excess. Clint Ramos’ set is an alley-style mirror platform that looks ready made for the world’s biggest line of coke. Meanwhile the transition lighting by Japhy Weideman is the kind more familiar to the United Center than to the Steppenwolf Upstairs Theatre. 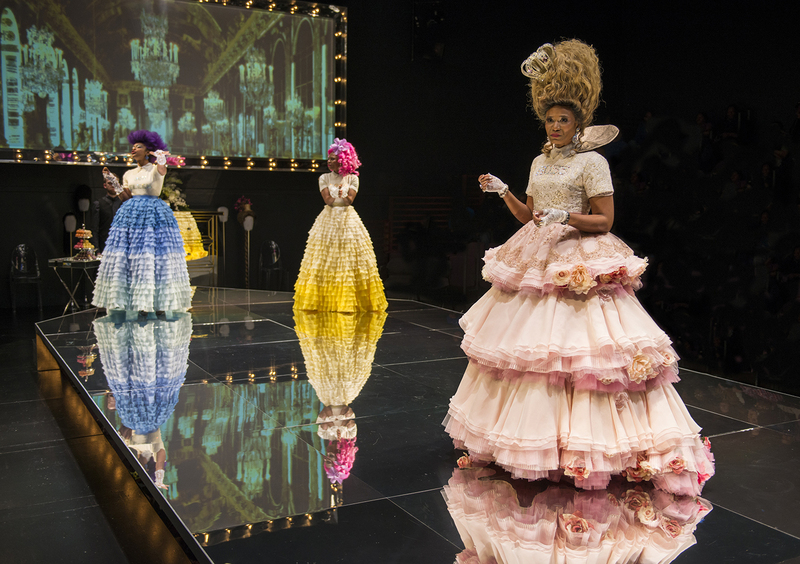 Dede Ayite’s costumes are likewise ebullient, gorgeous, tacky, and just the right amount of too much. Steppenwolf Theatre Company, Upstairs Theatre, 1650 North Halsted, (312)335-1650, steppenwolf.org. $20-$86, Through May 10.